London: an alternative world in which resources have almost run out. 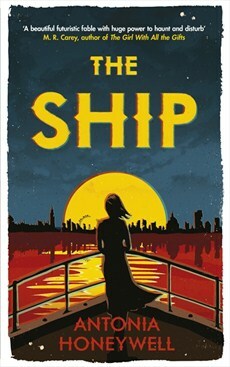 This is the world of The Ship by Antonia Honeywell. Sixteen-year old Lalla lives in a sheltered world managed by her parents. Her time is spent in safety, in their flat, or wandering the corridors of the British Museum, anything to avoid the danger, the shortages, the violence of this alternative London. People without homes camp in public buildings and parks, but they are a drain on the scant resources and are bombed, murdered in the name of preserving resources for the few who are ‘registered’. If you don’t have a card, you don’t exist, cannot get food or shelter. Lalla has never eaten a fresh apple, and she begins to dream about what a real apple feels like, tastes like. On ‘The Ship’ she finally is given an apple. But like most things on The Ship, the apple is not what it seems. Lalla’s childhood has been governed by her parents’ political arguments, how best to make a life for Lalla, punctuated by her father’s mysterious disappearances. He is building something, gathering things, people, but Lalla does not know what. Until the day arrives when her father takes a decision for the family and takes them to The Ship. An actual ship which he has bought and over ten years has fitted out with stores and everything needed to support the hundreds of people he has selected: for their skills, creative talents or bravery. He has chosen everything, anticipated everything. The book really takes off when Lalla boards The Ship and tries to unravel the truth of what The Ship is, where it is going, and what is on the fourth floor. They eat tinned apple and powdered egg, read books on their ‘screens’ and discard their memories and grief in order to live in the now. It is a tale of growing up, of unpalatable truths, of shaking off the illusions of adolescence and being brave enough to stand up for yourself, to make your own decisions not governed by your parents. It is green-eyed Tom who gives the apple to Lalla, but why? And what does Lalla choose to do? The ending will make you gasp. For more about Antonia Honeywell, click here for her website.